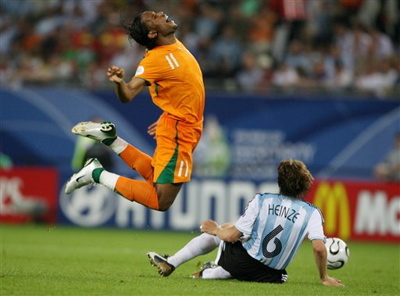 Diving (or simulation – the term used by FIFA) in the context of association football is an attempt by a player to gain an unfair advantage by diving to the ground and possibly simulating an injury, to appear as if a foul has been committed. Dives are often used to exaggerate the amount of contact present in a challenge. Deciding on whether a player has dived is very subjective, and one of the most controversial aspects of football discussion. Players do this so they can receive free kicks or penalty kicks, which can provide scoring opportunities, or so the opposing player receives a yellow or red card, giving their own team an advantage.